When people discuss the success – or possibly the lack thereof – of Sega’s Master System and Mega Drive consoles, they usually just look at the three big regions: Japan, North America, and Europe. Strangely, the place where these two machines were by far the most successful usually gets left out in these discussions. Brazil, being the fifth-largest country in the world, was also a rather significant market in the 8 and 16-bit days. There, both the Master System and the Mega Drive dominated the console gaming landscape during the late ’80s and ’90s. Their success can be directly tied to their publisher in Brazil. Tectoy, an electronic toy company, acted as Sega’s distributor in South America in lieu of an official subsidiary. 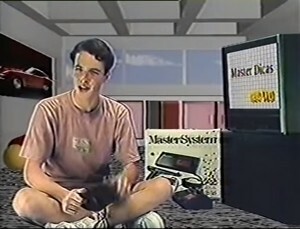 Whereas companies like Tonka in the U.S. or Irwin Toys in Canada had failed to make a significant dent into their respective markets when introducing Sega’s Master System, Tectoy managed to score. Not only was the 8-bit console a huge success in the South American country, it’s even still being produced and sold there today. 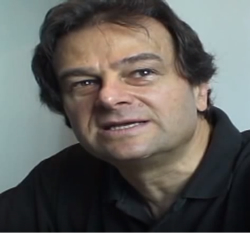 Stefano Arnhold was one of the first employees at Tectoy. Starting out as Marketing Director at the fledgling company, he took over as CEO in 1994 after the founder, Daniel Dazcal, passed away and still remains with the company as chairman. Fondly remembering the days of the 8-bit and 16-bit consoles, he was kind enough to share his experiences and anecdotes with Sega-16. Sega-16: You were Marketing Director at Sharps before joining the newly formed Tectoy. What made you leave the company to join a new startup focusing on electronic toys? Stefano Arnhold: My boss at Sharp at the time, Mr. Daniel Dazcal, left the company in March or April of 1987 and started to look at new opportunities. He found out that many companies, in different fields, could use new electronic technologies. So he started Elsys, a company dedicated to develop electronic solutions. He studied various fields, and the first one was in major appliances (white goods). He developed an ASIC for Whirlpool Brazil (Brastemp) for a washing machine that replaced a heavy metallic mechanism. It was much lighter, much smaller, much cheaper, no CAPEX, etc. A big success. When he studied the toy industry in Brazil, there was a clear leader, Estrela, with 55% market share and 50 years of experience but that was basically not interested in electronics. So, he decided to start a toy company focusing on video games and electronic toys. That is when he invited me to join both companies, Elsys and Tectoy, in October. I left Sharp in December of 1987. Sega-16: What was the market situation like when Tectoy started in 1987? What was the economic situation, and what was the market like in terms of electronic entertainment? So we focused our studies and research on the end consumer, as the traditional toy retailers seemed to follow the local industry. One good example is PenseBem (Think Well), a learning aid toy from Vitech that became toy of the year in 1988 and one of the most successful toys ever in Brazil. When we first approached the retailers, they said such a category would never sell well in Brazil because they believed parents considered that their children were not handicapped and did not need such a learning aid. Our research told us the exact opposite. Parents clearly saw PenseBem as the first contact their children could have with the fantastic new world of computers, a world they did not master and a world where clearly they would like to see their children getting started in at an early age. We immediately had major success as our TV ads were quite sophisticated (we spend five to 10 times more on a TV ad production than the average competitor), our toys were different, our business practices were more related to the consumer electronics industry, our toys came with batteries included in the box, we offered customer services and a nationwide repair shop chain, etc… All of that despite the general economic situation of the country not being promising at all. Sega-16: How did the partnership with Sega come to pass? Stefano Arnhold: Our main goal, since the beginning, was to enter the video game market. One of the reasons I was hired by Sharp in early 1983 was because I had studied that market (Atari, Intellivison) and handheld games (Nintendo Game & Watch), so I had many contacts in that field. We approached Sega, and the first Sega product we introduced in Brazil was a laser gun game based on the Japanese anime Zillion. As Zillion was one of our first products and we had 100% of the company focused on making it a big success, we sold more units in Brazil that Sega did in Japan. We also managed to air the series on Brazil’s largest TV station. So when we started to discuss the introduction of Master System in Brazil, as we had already a nice success story with the toy department of Sega to tell to the people responsible for home video products. Sega-16: Who were your contacts at Sega? Was there any particular hierarchy or chain of command in your collaboration? Stefano Arnhold: I think what really helped us a lot was our experience in working with Japanese companies. In fact, all my experience had been with Japanese companies, as I worked in Photography with my uncle before joining Sharp, representing Japanese manufacturers such as Minolta and Yashica. My boss and partner, Mr. Daniel Dazcal, had also acquired much experience having worked with Sharp for 15 years. So we knew exactly how to respect the Japanese Ringi system and how to work any new idea from bottom up with the necessary patience, respecting their culture and decision-making process. We earned their respect and, more importantly, their trust and confidence. Sega-16: Concerning the Ringi system, who were your “superiors” in that context? Was it any person in particular that you had to refer to first? Where did you stand in the hierarchy of things? Stefano Arnhold: We had many different people working with us at Sega in Japan. Mr. Itofusa, Sales Director, was for many years our main contact, as were the people working for him of course. At the beginning, the daily communication was made though faxes; we still have tons of paper in our archives as a result of our daily and intense fax exchange. Mr. Yagi, Itofusa’s boss, was quite important as well, especially in the beginning and when Sega choose to appoint us as exclusive distributors. On the technical side, Mr. Sato (Director) was very helpful, as well as Shimazaki-san in software development. For many years, Egi (a young lady) was our guardian angel in Tokyo. We also had regular meetings with Sega’s President Mr. Nakayama and other executives. I think that I have more than 200 business cards from Sega. Sega-16: What was the relationship with Sega of Japan like? Stefano Arnhold: Sega Japan was not an easy company to work with. Sometimes we thought that we were more Japanese then Sega itself. For sure, we were more patient than they were, as we knew exactly what we wanted as there was a huge market waiting to be explored by us. But we had a big advantage over Nintendo. Gradiente/Estrela (their distributors in Brazil through a company named Playtronic, afterwards acquired by Gradiente and named Gradiente Entertainment) had a contract with Nintendo of America that did not give them control of the manufacturing process. Meanwhile, we worked directly with Sega Japan, as producing [the consoles and games] in Brazil was crucial for the success in the local video game market. But all in all we had a great relationship, and many times when Sega brought its international distributors and subsidiaries together, Brazil was cited as a reference in many aspects. Sega gave us a very strong support and backed us in many important initiatives: helping us to synchronize our releases of new product (hardware and software) with the rest of the world, and backing our initiatives of developing local contacts as well as hardware tailor-made for our market. We teamed up to open up the Latin American market in perfect synthesis. We would never have had the success we had in Brazil and in the Mercosur market without this very special support from Sega. Sega-16: What were the biggest challenges you had to face bringing the Master System (and later the Mega Drive) to Brazil? What obstacles were there, and how did you tackle them? Stefano Arnhold: First of all, we had to convince Sega that we were the right partner. They had a bad experience with Tonka, the company that distributed the Master System in the U.S., and some executives at Sega thought that toy companies were not a good way to distribute their video games. Also, Gradiente, a local Brazilian company and quite larger than Tectoy at the time, had introduced the Atari 2600 in Brazil and made a huge effort to take the video games sector from us. Second was the local manufacturing. Here, as I said before, the direct contact with Japan was key. When they visited our factory in Manaus and also the TV factory of our parent company, Evadin, they saw that we had the capabilities to produce Sega video games with a high quality, maybe even better than some of their sub-contractors in Taiwan or Hong Kong. The fact that we had also manufactured the Zillion product locally in Manaus also played a big role in their decision. Third, Nintendo was already quite well known in Brazil, as it penetrated 33 million U.S. homes with the NES at that time and Sega only 1.8 million U.S. homes with the Master System. With Sega virtually unknown in Brazil and having to compete with NES clones already present in our market, we had to do things differently. Again, we concentrated our research on the end consumer and repeatedly visited Sega of America to better understand areas like customer support, hints and tips or market research, to name a few. The telephone systems at the time in Brazil were all analog, which made providing a hints-and-tips-service by phone more difficult. We ended up being the second company in Brazil to have a full system where the end consumer could choose from a huge menu with the help of an “URA” (ed.-Unidade de Reposta Audivel, Portuguese term for “voice response unit;” VRA). We also decided to go to the main TV channels in Brazil (open TV, not cable) and present hints and tips every day in a one minute program at the end of each afternoon. 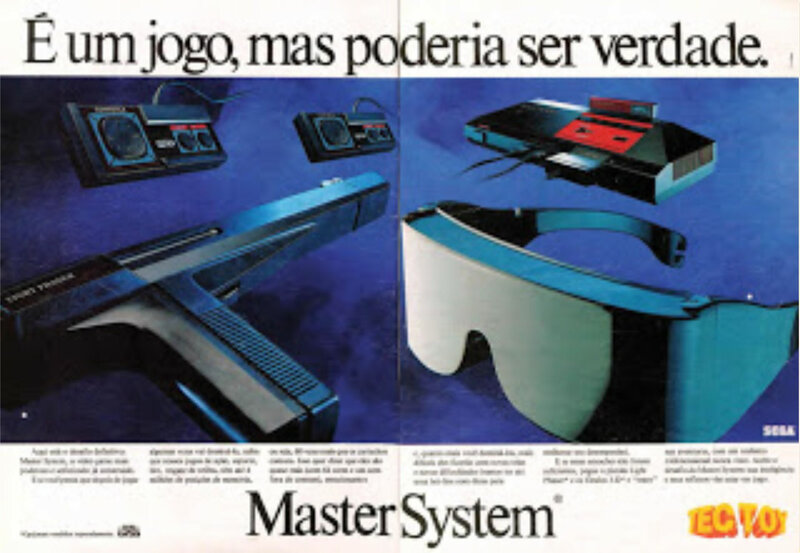 It was called Master Dicas and then later Sega Dicas. It turned out to be a huge success. We also started the “Sega Club,” which eventually reached one million members, and about 200 thousand of them were quite active participating in championships, promotions, discount campaigns with retailers for school materials, etc… For example, the club arranged for sneak previews of movies or discounts for the Formula 1 Grand Prix, to name a few. 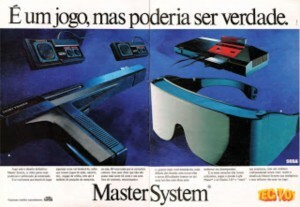 The Master System was better hardware than the NES, and one unique feature it had was the 3D Glasses. We focused on this distinction and had a TV commercial produced in Los Angeles (CA) with computer graphics, which at that time was something quite new. We spent a small fortune to produce and air that ad, and the response was felt immediately. We also helped introduce dedicated video game magazines into Brazil and produced maps in cooperation with those magazines. Alex Kidd in Miracle World was the first, another big success. And of course, we had ten times more content to offer than all the Famiclone manufacturers combined. So very quickly we conquered about 75-80% of the 8-bit market, and what was more important, we became “school yard gossip;” the boys in school were talking about the Master System, and the kid who did not know the correct sequence of Alex Kidd’s Jan-Ken-Pon was in serious trouble. When the Mega Drive was ready to launch, things were 100 times easier, as we were the clear leader in video games in Brazil by then. Sega-16: What kind of liberties did Tectoy have when bringing Sega consoles, games and other gear to the market? Stefano Arnhold: We had total liberty. We were very proactive and shared our vision and strategies with Sega constantly: We had at least three to four big meetings a year, a very detailed monthly report, and had daily, very intense contact by fax. We licensed Sega games with more than fifty third parties. We introduced most of the add-ons and accessories available to the Brazilian market. When there was no more new development of 8-bit games going on, we converted Game Gear games to the Master System and started producing our own games. Sega-16: What kind of contact and relationship did Tectoy have with Sega of America? Stefano Arnhold: We had an excellent relationship with SOA and learned a lot from their experience. We visited SOA at least twice a year, sometimes even more often. They were very kind to us and very collaborative, especially during the time of Mr.Kalinske. Our direct contact with Sega of Japan gave us access to a lot of information, and sometimes we had some information on future developments that not everybody at Sega of America was up to date with. The Brazilian market is far more related to the US market than to Japan though, so the help from Sega of America was very much appreciated. We also visited Sega Europe at least once a year,usually immediately after the European Computer Trade Show ECTS. The exchange of information with Sega Europe was also very beneficial for us. 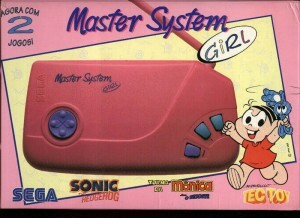 Sega-16: Tectoy manufactured a number of exclusive console variants of the Master System (like the Master System Girl for example). Over the years, how many versions were there? Stefano Arnhold: We did a lot of bundles exclusive to Brazil, like Mega Drive bundles with Street Fighter II or with FIFA Soccer, to name only a few. Later we bundled more than 80 Mega Drive Games or a Master System with 132 Games already built in. Maybe the two more interesting and unique hardware iterations were our Master System Super Compact and the Master System Girl. The Master System was quickly losing ground to the Mega Drive, so we had to invent something completely new. In 1994, we came up with a wireless hands free battery operated Master System, the Super Compact. It was a big success. Research had also shown us that about little bit more than 20% of girls played video games, but less than 10% owned a console. So, we developed a pink Master System Super Compact for girls, bundled with a Monica Game (Monica, a girl, is a very famous cartoon character). We sold a good number of those pink consoles, but that didn’t really dramatically change the percentage of girls owning a video game console. Sega-16: How big was the effective market share of the Master System or the Mega Drive between 1987 and 1996 in Brazil? Can you name a few concrete numbers? Stefano Arnhold: We reached 80% market share in Brazil. Up until today (ed – Sept. 2015), we have produced and sold over five million Master System consoles, over three million Mega Drive consoles, and approximately 62 million units of software across all platforms (8, 16, 32, 128, portable, Pico, etc. That’s including built-in software). 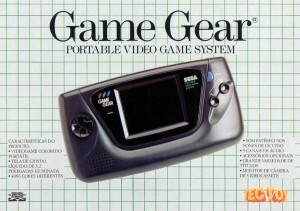 Sega-16: What role did the Game Gear play at Tectoy, or in Brazil, in general? Stefano Arnhold: The Game Gear was an excellent product but quite expensive. So, although it was a sales success, it never reached sales numbers like those of the Master System or Mega Drive, or even the Sega Saturn or Dreamcast. It was great for the brand, as it was the only color, handheld 8-bit console on the market. People loved to use the Gear-to-Gear cable and play Super Monaco GP or Columns against one another. There was an interesting story related to the handhelds. We found a Taiwanese manufacturer that had its own black & white unit.We liked it, so or engineering department worked to enhance a prototype of what could have been a great product. We talked to a big handheld game manufacturer and distributor who was not specifically into video games but distributed LCD handheld games. We showed him the product and asked him if he would team up with us if we were able to license Sega Games to this device. He seemed eager to join us in this venture, and his U.S. numbers were quite encouraging. Unfortunately, the idea died very quickly, as Sega simply denied our repeated request. They argued that Sega would not support a B&W handheld video game console, as they only produced colored products like the Game Gear. Sometimes, I wonder how the portable market would have turned out if this product would have been launched. Sega-16: What were the most popular Sega games in Brazil during that time? Stefano Arnhold: Sports games were very popular, football (soccer) games in particular, with FIFA being a great franchise that we strongly promoted on TV. Also, games like Sonic and Disney titles sold very, very well. Racing games and fighting games were a must. Virtua Fighter, Mortal Kombat, and Street Fighter were huge successes in Brazil. Even RPGs sold well. We localized RPG games for many different platforms, starting with Phantasy Star for Master System. Edutainment games did not sell well. We started a big TV campaign to launch Carmen San Diego for Master System, Mega Drive, and PC, and it was a big disaster. They were fantastic products, but they just didn’t sell. Puzzle games like Columns also did not sell well in Brazil at the time, only much, much later as cell phone titles. Sega-16: How did the release of the Super Nintendo affect the market in Brazil? Stefano Arnhold: The NES had no chance in Brazil.We dominated the 8-bit market and the Famiclones/NES clones accounted for the remaining part of that segment. The Super Nintendo was a very good product though, and their volumes increased slowly, but it did not change the overall Sega dominance in the Brazilian video game market. Gradiente Entertainment that was the manufacturer and local exclusive Nintendo distributor at that time, and they did a good job promoting the product. Sega-16: You had mentioned a few services for the Mega Drive the rest of the world never saw. For example, there was the Home Banking System and the Mega Net II. Could you tell us a bit more about that? Stefano Arnhold: We teamed up with Bradesco, at the time the largest private banking institution in Brazil, to develop and promote a special home banking device for Mega Drive. At the time, phone lines in Brazil were very expensive, in some places up to U.S. $5,000 for a single line, so we developed a system in which we stayed connected to the bank’s talker for only 16 seconds to download/update the data and immediately cut the connection. This was excellent for the bank compared with computer access or normal consumer access by phone. The bank promoted the device and the customers paid only like U.S. $8 per month for the service. Then we developed Mega Net I, as our goal was to connect video games to the Internet and get the Sega community more united, boost the Sega Club, and other activities. With Mega Net I, the consumer could send and receive emails and faxes which went through our main servers, receive video games news, and in some places there were even shopping possibilities with one of our retail clients. Later on, we released Mega Net II, which added head-to-head gaming, chat, record-keeping, and other capabilities. We were working under 200msec of latency using normal telephone wires. The server would check the zip code of the player and recommend another player nearby, but the system worked well when one player was challenging a top-ranked player of a particular game, even if he was on the other side of the country. For the 1996 Atlanta Summer Olympic Games, we did a huge promotion. We hired five Brazilian super athletes (each of them won a medal), licensed a very famous Brazilian love song and changed the words from “don’t send your love to him, send it to me” to “don’t send an email to him, send one to me;” the public could send emails through their Mega Drive to their favorite athlete in Atlanta. We found out later that most of the people from the common public, people who were not Mega Drive owners, did not know what an email was. Sega-16: How many subscribers did the Mega Net have? In 1996, the Internet as we know it today was neither very popular nor very developed yet. AOL, Compuserve, and Prodigy dominated the market with private browsers, quite different from today. It also took the video game industry many years to make the Internet access to video games a reality. Sega-16: How long did you provide support for the Mega Net? In what year were the servers eventually shut down? Stefano Arnhold: It was quite tough to shut down the system, since many people were using it on a daily basis to send/receive emails or faxes. When we wound things down, we started offering one cartridge, then two cartridges, and so on to convince people. I remember that there was one guy in the very southern part of the country that did not accept any of our offers and was threatening to sue us. Sega-16: There were also a number of unique conversions of Master System and Mega Drive games. For example, the Wonder Boy games (like Wonder Boy in Monster Land) were retooled starring characters from the popular Turma da Mônica comic series (like Mônica no Castelo do Dragão). How did the licensing come to pass, and who made the conversions? Stefano Arnhold: This was part of our main strategy, develop games with popular local characters. The first one was Monica no Castelo do Dragao, where we licensed Monica, a popular comic series character from Mauricio de Souza Producoes. Mauricio was kind enough to personally participate in the program. At one point we had a big problem, as Mauricio did not authorize Monica to hold the sword from Wonder Boy, but we could easily solve the problem by substituting the sword with Monica´s blue rabbit called Sansao, and Mauricio authorized the continuation of the development. We did at least a dozen of those conversions with those or different franchises. Sega-16: There’s the story that Tectoy was the driving force behind the creation of “Ayrton Senna’s Super Monaco GP II,” starring the famous Brazilian F-1 pilot. What is the story behind this game? What was the creation like? Stefano Arnhold: At the time, Ayrton Senna was the number one Brazilian hero, so we approached Sega with the idea of developing a Mega Drive game starring the F1 driver. The good thing was that we did not need to explain who Ayrton Senna was. The Japanese knew him very well, since he was driving for McLaren, who used Honda engines. Also, Irimajiri-san, Sega’s Vice President at the time, was a former high ranked executive at Honda and knew Ayrton Senna personally, as the F1 department had been under his direction. 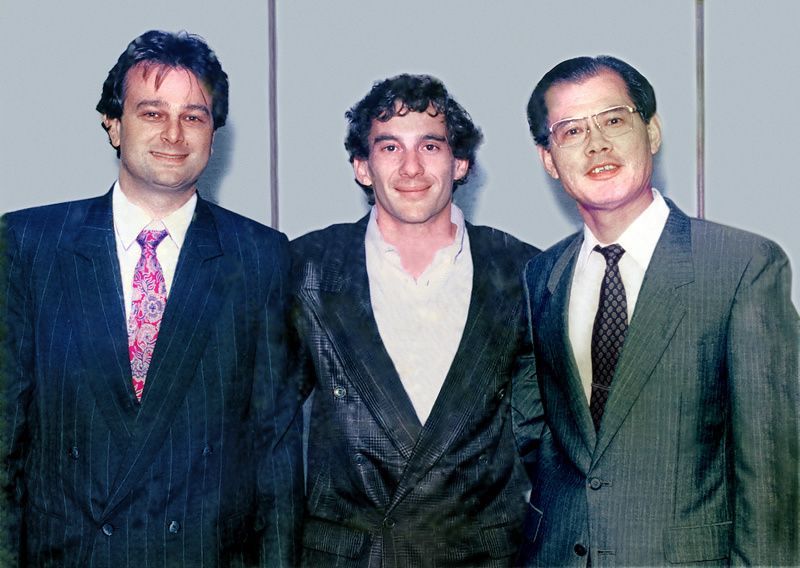 Arnhold, F1 champion Ayrton Senna, and head of Sega Consumer Products Dai Sakurai. Ayrton himself loved the initiative and was directly involved in the project. Ayrton was a perfectionist and did not rest until he saw the changes he asked for in the games. For instance, the original program would progressively damage the car when you passed over the zebra. Ayrton explained that this was normal and the programmers had to adapt the code accordingly. The game featured synthesized voice, and Ayrton was asked to tape a short comment for each of the 16 tracks. The problem was that he had never raced in Barcelona before, which back then was a new track for the F1 circus, and he refused to give a comment before he had experienced it. The race would take place far into the F1 season, and this could potentially have jeopardized the release schedule, but Ayrton was extremely professional about this, and he committed to tape a comment immediately after the race. The developers in Japan had to change the development schedule to adapt to this new condition, and Ayrton kept his promise and recorded the tape a few hours after he finished the race in Barcelona. We became friends with Ayrton and also developed toys for Seninha, a comic book character based on Ayrton, in record time so they could be launched with the character with a nice party in Sao Paulo. The game sold very well worldwide for the Mega Drive and also for the Master System in Brazil. This was a very rewarding project, and Ayrton visited Sega in its Haneda headquarters on Wednesday just before being crowned world champion in Suzuka on Sunday. He said he had only 45 minutes to stay at Sega, but he eventually ended up staying three and a half hours with us and the developers of his game. I never saw Sega as upside down as it was that day, with many employees leaving their desks just to see him. Sega-16: Were there any other pitches or suggestions Tectoy made when it comes to Sega in terms of worldwide releases? Stefano Arnhold: The only one that came through was Ayrton’s game. The B&W handheld did not even pass the first meeting. We were, however, the first ones to put the AC adapter inside the console, reducing costs. We did it for both the Master System and the Mega Drive. Sega was not very happy, stating that we could have heating problems. In fact, our solution turned out to be very efficient, and Sega, which was initially 200% against it, later adopted the same solution when it launched the Sega Saturn. Sega-16: There are a few other exclusive games for the Master System or the Mega Drive that only saw release in Brazil. Some of them were really hot properties. Could you tell us more about games like Ferias Frustradas do Pica Pao (starring Woody Woodpecker), Street Fighter II for the Master System, or Nightmare Circus and Duke Nukem 3D for the Mega Drive? How did Tectoy get the licenses, and who made those games? Stefano Arnhold: Except for Nightmare Circus, all were developed in-house by Tectoy. Sega-16: So did you buy the full license to the game, as it was, directly from Sega of America outright? Stefano Arnhold: We had a master license for games developed by Sega, which also included Sega Europe and Sega of America. In those cases, when Sega owned the game or its distributions rights, we automatically had the right to sell it in our territory. Regarding Pica Pao, we discovered that Woody Woodpecker was the most shown cartoon on Latin American TV. It had the largest number of episodes aired and was very popular in many countries, so we licensed the character with Universal and developed the game for the Mega Drive. We also did a Game Gear version that was intended for the U.S. market, but when the game was ready, the interest for Game Gear there was already waning. Sega-16: Pica-Pau appears to be a game developed completely in-house at Tectoy, mechanics, assets, and all; however, there are rumors that the publication of the game was delayed in some way, is that true? Stefano Arnhold: It took us quite a long time to develop the game. The development team wanted to make it better and better, easier to play, etc. We had to take a business decision and stop them at some point to finally release the game. Sega-16: What about Street Fighter 2 or Duke Nukem 3D? Stefano Arnhold: Eventually, as at some point nobody was developing 8-bit or 16-bit games anymore, we decided to develop Street Fighter II for the Master System and Duke Nukem 3D for the Mega Drive. To approve Street Fighter II with Capcom, we hid the Master System console and handed Capcom’s manager a Mega Drive controller. His first comment was that it was a nice game but quite simple for a 16-bit release. Then we unveiled the 8-bit console. He smiled and approved the development of the game. We thought that the hard thing to get was Duke Nukem 3D license for a Mega Drive development. After we finally got the green light, we found out that it was very difficult to develop the first-person perspective of the game. We went back to the Master System’s Phantasy Star to find solutions that would fit the reduced memory available for a 16-bit game compared to a PC game. Sega-16: Would it be possible to elaborate a bit on that? How hard was it to get the license. Did you run into any trouble there? Stefano Arnhold: Here I have to confess that my memory is not helping, I do not remember the details very well anymore. Sega-16: In 1995, Sega decided to discontinue the Mega Drive in the rest of the world and released the Sega Saturn. What effect did that have on Tectoy and the market in Brazil? Stefano Arnhold: When we launched the 16-bit Mega Drive, we maintained the 8-bit Master System. The same occurred when we introduced the 32-bit Sega Saturn: we kept the other two platforms. 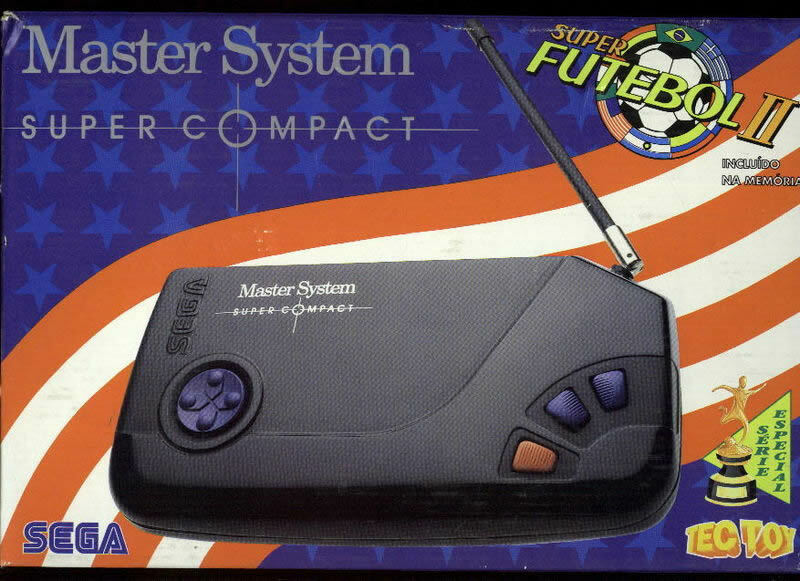 In fact, we still produce and sell Master Systems today. At one point a few years ago though, we had to discontinue the Mega Drive, as the consumers apparently did not understand the difference between 8 and 16-bits and would not pay more for a 16-bit console with fewer built-in games. The Master System in Brazil is the only console in the whole world that’s been sold for 28 years straight. Sega-16: In 2001 and 2002, Tectoy brought out the last official cart releases for the Mega Drive worldwide, the two Show do Milhao games based on the TV show. Is there any particular story behind that? Stefano Arnhold: As I mentioned before, we needed to bring “new blood” with new releases every year. Show do Milhao is the Brazilian version of Who wants to be a Millionaire and was very popular in the country. We even developed a project to revive the Mega Net, so that couch potatoes could play Show do Milhao online from home. Unfortunately, the TV Station did not approve it. Sega-16: Tectoy is still producing variations of the Master System, and until recently, the Mega Drive, like the Mega Drive 4 Guitar Idol (the latter even with its own original peripheral). What role do the Master System and Mega Drive play nowadays? Stefano Arnhold: As I explained, we had to discontinue the Mega Drive a few years ago, but we still enjoy good business with the Master System. What explains that we can sell an 8-bit video game console almost 30 years after it was first released? Well, it is perfectly suited for very young players that cannot master a Playstation or an Xbox. Aside from being very simple to play, it comes with 32 games built in, containing a full library of the best Master System games. Sega-16: What does the future hold for fans of the Mega Drive and the Master System in Brazil? Stefano Arnhold: Well, we have been asked by many fans to re-launch the original Master System Console in a special commemorative retro version. We are currently studying this possibility. We would like to thank Mr. Arnhold for his time and candor during this interview. Feature image courtesy of UOL. I wished you asked Stefano about the Chapolim x Dracula game. I’m curious how the licensing agreement happened.